A 21-year-old female presented with acne-like blackheads on brownish areas located on the cheek. She had been treated with neodymium-doped yttrium aluminium garnet (Nd-YAG) laser (1071 nm), 160 j/cm 2 , three months ago for erythema and telangiectasia of her face. Afterwards, she developed atrophic, slightly depressed, hyperpigmented, 3-4 mm scars with superimposed tiny comedones within the treated areas. Topical treatment with tretinoin 0.05% cream on alternate days, and Sun Protection Factor (SPF) 50 sunscreen daily were commenced. After 2 months, comedones and hyperpigmentation mostly resolved but mild superficial atrophy persisted. According to our knowledge, this is the first case of atrophic scars studded with open comedones, developing shortly after laser therapy used for facial telangiectasia. Comedone formation due to laser therapy has not been described before. 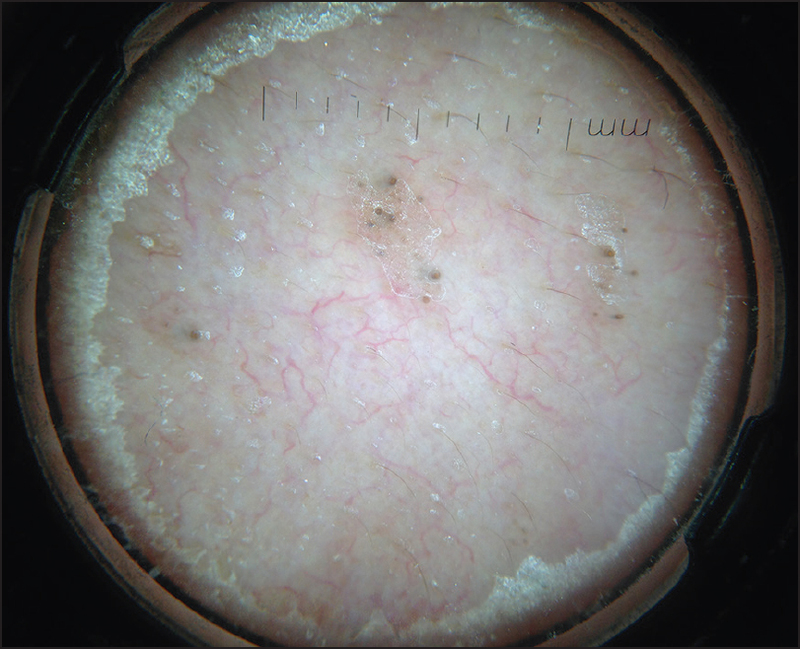 Here, we report a case of atrophic scars studded with open comedones, developing shortly after Nd-YAG laser (1071 nm) therapy used for facial telangiectasia. 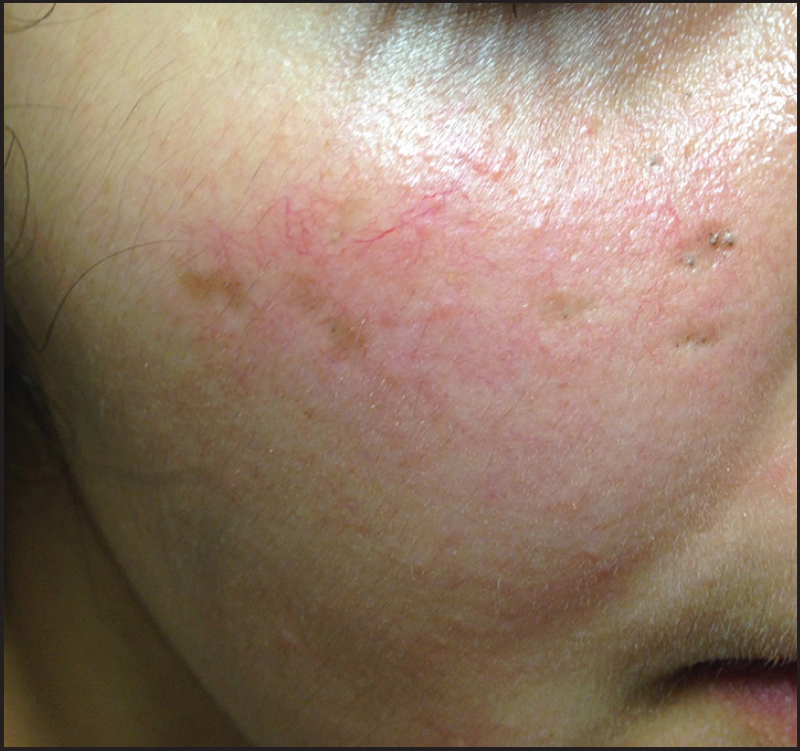 A 21-year-old female presented with acne-like blackheads on brownish areas located on the cheek, which where recently treated with laser therapy. The patient had constitutional bilateral facial erythema and telangiectasia. She had been treated with neodymium-doped yttrium aluminium garnet (Nd-YAG) laser (1071 nm), 160 j/cm 2 , 3 months ago. 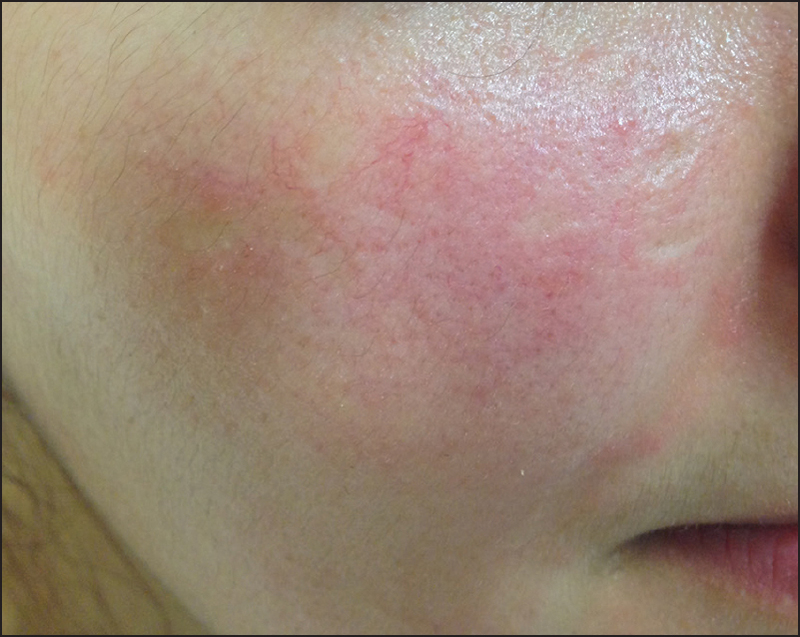 Immediately after treatment, marked facial redness and edema developed, most prominently on the right cheek, followed a few days later by small areas of dark scabbing. The reaction spontaneously subsided in about a week, but soon afterwards developed depressed areas with blackheads. She applied wet cold dressings with tap water and put silver sulfadiazine cream twice a day for 1 week after the laser treatment. She was not on any oral or topical medication before the laser treatment. Dermatological examination revealed facial erythema and telangiectasia involving both cheeks and zygomatic areas. There were atrophic, slightly depressed, hyperpigmented 3-4 mm scars with superimposed tiny comedones on the right cheek [Figure 1]. Dermoscopic examination clearly demonstrated the grouped comedones strictly confined to atrophic lesions [Figure 2]. Topical treatment with tretinoin 0.05% cream was commenced on alternate days and Sun Protection Factor (SPF) 50 sunscreen daily. After 2 months, comedones and hyperpigmentation resolved, and though atrophy persisted, it was more superficial than before [Figure 3]. There are a limited number of reports describing a Favre-Racouchot-like disease that developes after radiotherapy, with lesions restricted to the irradiated area. Similar to UV, ionizing radiation might induce chronic follicular inflammation with secondary follicular hyperkeratosis, alterations of connective tissue support, and the production of comedones. Several cutaneous complications of vascular laser therapy for telangiectasias have been reported. Among these, erythema, edema, purpura, hyper- and hypopigmentation, blistering, atrophic, or hypertrophic scars are well-known.­  Through the literature search, we have not been able to find a case in which comedones developed after local trauma, induced by vascular laser therapy. However, some recent reports have described Fox-Fordyce-like disease following laser hair removal, appearing on the treated areas. , One of these cases was treated with alexandrite laser (755 nm), and the other with diode laser (800 nm). Fox-Fordyce disease is an inflammatory disorder of apocrine glands, and caused by infundibular keratinization and subsequent apocrine duct obstruction. Dilation of the follicular infundibulum with hyperkeratosis and keratin plugging is a common feature of this disorder. In the abovementioned cases, laser therapy might have induced damage to the follicular infundibulum, causing altered maturation of keratinocytes that led to keratin plugging which resulted in comedones. In our patient, the fact that the comedones were confined to the depressed areas due to laser trauma, suggests a close relationship between comedones and laser effects. A possible explanation for this relationship is that the edema and inflammation caused by the laser therapy might have predisposed to follicular degeneration and retention of hyperproliferating ductal keratinocytes, which resulted in a keratin plug. In addition, posttreatment atrophic scarring with loss of elastic and collagen fibrils might have played a role in the formation of comedones. In conclusion, we suggest that laser therapy is another physical factor that induces comedones. Comedone formation, associated with atrophic scars should be included in the complications of laser therapy for vascular lesions. Cunliffe WJ, Holland DB, Jeremy A. Comedone formation: Etiology, clinical presentation, and treatment. Clin Dermatol 2004;22:367-74. Patterson WM, Fox MD, Schwartz RA. Favre-Racouchot disease. Int J Dermatol 2004;43:167-9. Hubiche T, Sibaud V. Localized acne induced by radiation therapy. Dermatol Online J 2014;20. Bhushan P, Aggarwal A, Yadav R, Baliyan V. Generalized granuloma annulare with open comedones in photoexposed areas. Clin Exp Dermatol 2011;36:495-8. Güneº P, Göktay F, Mansur AT, Köker F, Erfan G. Collagen-elastic tissue changes and vascular involvement in granuloma annulare: A review of 35 cases. J Cutan Pathol 2009;36:838-44. Srinivas CR, Kumaresan M. Lasers for vascular lesions: Standard guidelines of care. Indian J Dermatol Venereol Leprol 2011;77:349-68. Sudy E, Urbina F, Espinoza X. Open comedones overlying granuloma annulare in a photoexposed area. Photodermatol Photoimmunol Photomed 2006;22:273-4. Tetzlaff MT, Evans K, DeHoratius DM, Weiss R, Cotsarelis G, Elenitsas R. Fox-Fordyce disease following axillary laser hair removal. Arch Dermatol 2011;147:573-6.